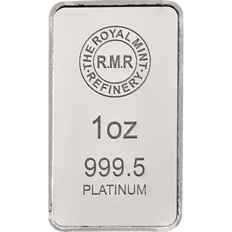 We offer a variety of platinum bullion bars of 999.5 fineness in weights ranging from 1 oz to 1 kilogram. 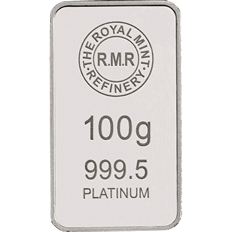 Bearing the distinctive branded 'RMR' logo, our platinum bullion bars are protected in secure serialised packaging and are printed with a unique serial number that matches the one imprinted on the platinum bullion bar to act as a certificate of authenticity and quality. Our platinum bullion bars come with free UK delivery or alternatively, we offer customers the reassurance of fully insured, secure storage of platinum bars on weights of 100g or more. Storing your platinum bars in our dedicated storage facility offers you the additional benefit of being able to sell your investment back to us at any time. Bars of 100g and above are available for storage in The Vault, our on-site precious metal storage facility. 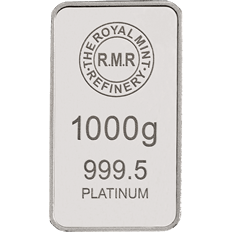 Platinum Bullion Bars are VAT free when stored and sold from The Royal Mint Vault. For further information please see here.